Peripheral Arterial Disease (PAD) can cause the artery that normally supplies blood to the muscle to become narrow. When that happens, less blood can flow through the artery. When you’re resting, enough blood flows to the muscle to meet the needs of the muscle. However, when you walk, the working muscle needs more blood. The narrowed artery may not let enough blood through. 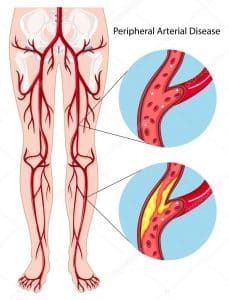 What causes Peripheral Arterial Disease and Claudication? The most common cause of narrow or blocked arteries is the buildup of fatty deposits inside them. This is called atherosclerosis. Claudication occurs because not enough blood is flowing to a muscle you are actively using. Your doctor may suspect that your arteries have narrowed and will check the pulses in arteries in your legs and feet. The doctor will listen to the blood flow with a stethoscope or a small Doppler device. Your doctor may hear a noise, called a bruit, which can be a warning that there is a narrowed area in the artery. Blood pressure in your ankles can also be compared to blood pressure in your arms. This test is called an ankle-brachial index, or ABI. Your doctor may do some other tests to look into possible PAD. He or she may also do tests to see if arteries in other parts of your body have atherosclerosis. Can PAD and claudication be prevented or avoided? Risk factors for peripheral arterial disease and claudication include high blood pressure and diabetes. As well as, high cholesterol, cigarette smoking, and older age. Claudication is also more likely in people who already have atherosclerosis in other arteries. Such as the arteries in the heart or brain. People who have claudication may have already had heart attacks or strokes. What is the likely cause of my PAD/claudication? What lifestyle changes do I need to make at home to help relieve my symptoms? Is it safe for me to exercise? How do I get started? What treatment option is best for me? Will I need medicine? Surgery? Will the medicine you’re prescribing interact with medicine(s) I already take? Do PAD or claudication put me at risk for any long-term problems? How is Claudication related PAD treated? In order to salvage the limbs, PAD is medically treated with prescribed medications. These medications treat high cholesterol, control blood pressure. As well as, decrease pain while walking in order to increase exercise. They also aim to prevent the buildup of plaque or formation of blood clots. Peripheral artery disease is also treated using minimally invasive interventional radiology procedures. Angioplasty is when the blocked artery is opened up using a medical balloon, enabling better blood flow. In some cases, the affected arteries need to remain open using a stent, which is a small metal cylinder. This treatment is stenting. In some cases, PAD may be serious enough that a medical team has no choice but to perform surgery. This may be the only way to remove blockages or create bypasses around the clogged areas. Can peripheral arterial disease be treated without medical intervention? If found early enough, PAD may be possible for a patient to treat it with lifestyle changes. This most often entails quitting smoking, undertaking an exercise program, and focusing on a healthy diet. It is important to note that if you believe you may be suffering from PAD, you must see a doctor. This is potentially a limb and life-threatening condition. Your doctor will determine the best course of treatment for you.